You can make some really cool things with an Arduino. And you can make some really cool things with a 3D printer What Is 3D Printing And How Exactly Does It Work? What Is 3D Printing And How Exactly Does It Work? Imagine if you could print out three-dimensional objects straight from a printer in your home. When I was a kid in primary school, I thought it would be awesome if I could print pizzas out... Read More . What do you get when you use them both? Some extremely cool things. 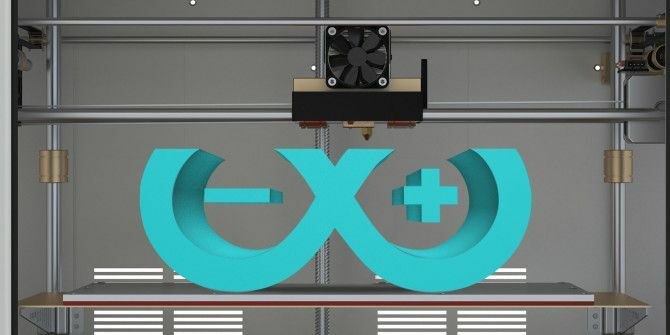 Here are 5 projects that you can 3D print and power with an Arduino (and, as a bonus, a 3D printer that you can make with an Arduino). Check them out and post your favorites in the comments below! Two of the most popular things in the geek world right now are 3D printing and drones. Why not combine the two to make a 3D printed quadcopter drone? By using a radio set, compass kit, motors, speed controllers, propellers, and a number of other parts combined with an Arduino and a 3D printed frame, you can build your own little quadcopter. You might have some of the parts you need hanging around if you have an Arduino starter kit 4 Best Starter Kits for Arduino Beginners 4 Best Starter Kits for Arduino Beginners There are plenty of great beginner Arduino projects that you can use to get started, but you'll need an Arduino and some components first. Here's our pick of 4 of the best starter kits for... Read More , but the rest can be bought online with ease. You’ll need to do a lot of wiring to get everything attached to the frame, but Nolan5454‘s instructions walk you through it with pretty clear explanations of what you need to do. And it includes the 3D printer files, so you’ll just need a printer to get everything to work. Once it’s all together, you can fly it via GPS or FM transmitter. Arduino robots 8 Arduino Robots You Can Build for Less than $125 8 Arduino Robots You Can Build for Less than $125 The Arduino can do a lot, but did you know it can create full-fledged robots? For quite cheap, too! Read More are a lot of fun, and you can get a lot of cool kits to make them. But if you want to do the whole thing yourself, this set of instructions from davidhrbaty will help you 3D print this little guy, and you can wire up the Arduino Nano Arduino Buying Guide: Which Board Should You Get? Arduino Buying Guide: Which Board Should You Get? 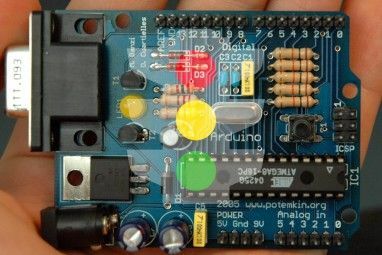 There are so many different kinds of Arduino boards out there, you'd be forgiven for being confused. Which should you buy for your project? Let us help, with this Arduino buying guide! Read More to get him running. The robot can be controlled by IR remote, automatically via obstacle detection, or in “monitor mode,” which uses an ultrasonic sensor. In addition to printing the body, you’ll need to have an Arduino Nano Arduino Buying Guide: Which Board Should You Get? Arduino Buying Guide: Which Board Should You Get? There are so many different kinds of Arduino boards out there, you'd be forgiven for being confused. Which should you buy for your project? Let us help, with this Arduino buying guide! Read More , some servomotors, an IR receiver and remote, an ultrasonic sensor, a speaker, and some AAA batteries. Fortunately, almost all of these things are virtually guaranteed to come in a starter kit, so you probably already have them around already. After that, you just need to make a quick print and set up the motors. I have to say that this is probably my favorite project of the bunch. It’s like a nerdier version of a lava lamp (didn’t think you’d ever hear that, did you?). You’ll need more parts for this project than the previous two, including a bunch of LEDs, capacitors, an oscillator, transistors, and an AC mains switch and connector. Because this one involves mains power, be extra careful when you’re working on it! Once you’ve collected the various parts, you’ll need to use some basic electronics skills to wire up the 3D printed double-helix to a rotating motor, like one from a microwave, and get the mains power connected. eLab’s Instructables walkthrough will take you through each step in detail. When you’re done, you have a rotating strand of glowing DNA! And if you like the idea of making your own lava lamp Top 10 Geeky Science Projects You Can Do At Home Top 10 Geeky Science Projects You Can Do At Home There's no end of YouTube tutorials ready to guide you through a diverse range of experiments, all of which will leave you amazed and hopefully enlightened - here's our favourites. Read More , you can do that, too. 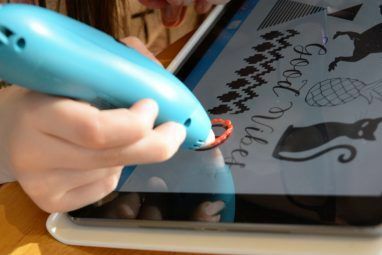 This project and some similar ones have been making the rounds since the release of Fallout 4, and you can see why: it’s a really cool little gadget! It requires quite a few unique parts, including: a gyroscope, power pack, a capacitive display with driver board, flashlight, pressure sensor, methane sensor, and a multi-part 3D printed case. You’ll need to make a custom I/O board to get this project working, but will sweatman’s Instructables page has clear instructions on how to do that, as well as a very detailed walkthrough of all the other steps. It’s a pretty involved project, but absolutely can’t be beat as a Halloween costume, cosplay accessory 7 Great Steampunk Projects Built With an Arduino 7 Great Steampunk Projects Built With an Arduino Great steampunk style includes blinking lights, moving parts, and gauges—all perfect candidates for automation with an Arduino! Here are seven that you can use for inspiration. Read More , or conversation piece! If you’re trying to build your own personal makerspace Starting a Makerspace on a Budget? Here's The Equipment You'll Need Starting a Makerspace on a Budget? Here's The Equipment You'll Need Makerspaces exist to provide a common space for members of the local maker community to work collaboratively on creative projects. Kitting out your own makerspace can be done cheaply, without any compromises on equipment. Read More , a CNC mill is a great addition. liquidhandwash notes on Instructables that it’s accurate enough to cut and drill circuit boards, so it should be good for any milling project you want to take on. It requires a large number of 3D printed parts, so you may want to consider using a printing service, but it wouldn’t be too difficult to print your own. You’ll also need quite a large selection of parts, including a lot of fasteners, some bearings, a relay module and DC connector, some metal parts for the surface, and an Arduino to run everything. Some of the links for the parts aren’t working on the Instructable, but they should all be easy to source. It’s quite a project, but then again, having your own CNC mill is quite a handy thing! Don’t Have a 3D Printer? Build One! If you don’t have a 3D printer, you have a few options for getting the 3D printed parts you’ll need for these projects: you could buy an affordable one 5 Cheap 3D Printers You Can Actually Buy Today 5 Cheap 3D Printers You Can Actually Buy Today A few years back, even the cheapest 3D printers were uncomfortably close to the $1,000 mark – now you can get a quality 3D printer for as low as $400. Read More , borrow one, use one at a local makerspace Four Reasons Why You Should Visit Your Local Hackerspace Four Reasons Why You Should Visit Your Local Hackerspace Read More , use a 3D printing service, or, if you really want to DIY, build one yourself. You can even build an Arduino-powered 3D printer for $60! This particular 3D printer, the EWaste $60 3D printer, is very small, and might not be big enough to print the parts for some of the larger projects above, but it’s a really cool home project, is very affordable, and is environmentally conscious, since it uses mostly recycled parts. You’ll need a couple of old CD or DVD drives, a floppy disk drive, a small stepper motor, a power supply, an extruder, and a few extras, but it’s actually a surprisingly simple project. You’ll need to do quite a bit of calibrating and basic electronics work, but the end product is surprisingly functional for what it’s made out of. Combining 3D printing and Arduino is a no-brainer, and the projects above should give you a good idea of the limitless potential that this combination provides. Whether you have your own 3D printer, you can use someone else’s, or you’ll use a 3D printing service, you can build your project from start to finish. What’s your favorite 3D printed Arduino project? Share links to new ones so we can check them out! Explore more about: 3D Printing, Arduino.